Marmite on toast with Avocado and Tomato - Bliss! Marmite – it seems people either love it or hate it. Maybe it’s because I grew up a Kiwi kid (that’s “New Zealander” to the uninitiated), but I love it – especially on toast. I was raised on it, it was a staple food of my childhood, just like Weetbix and Golden Crumpets and (vegetarian) barbeques at Christmas. I think I eat it more than I eat any other food. I’ll grab it for breakfast, maybe as a snack when I’m rushing out the door, or don’t have much time, or am just being lazy. It’s a comfort food. I’m cool with it plain, but when summer comes around I start loading it up with fresh avocado and tomato slices with black pepper and it becomes a gourmet meal. I’ll eat it for breakfast, then often lunch as well. It never gets old, or boring. I may stray to cereal for a day or two, but I always come back to it, glad to be home. The reason for this nostalgic rambling about yeast spread is that I was pondering the other day what I would choose if I could only eat one thing for the rest of my life. Nutritional problems like scurvy aside, I think it would have to be Marmite on toast. Now, you may read this and go, “What?! Marmite?! But Vegemite is better!” If this is the case, it’s possible you’re Australian. The Marmite/Vegemite debate has been going on since the beginning of time, as the dinosaurs fought over what to spread on their prey, the apes battled about the best one to dip their bananas in, and NZ and Australia now challenge each other on the rugby field year in year out with no hope of the conflict ever being resolved. It divides lovers, turns children against their parents, gives people something to talk about at lunch time with people they work with despite having nothing in common. As a kid, I was a strong Marmite advocate. I wore it’s slightly darker, richer and more flavoursome colours like a banner around my mouth after breakfast. My Dad, however, is a Vegemite man. Debates ensued, my mother suggesting there really wasn’t much difference was shot down in flames, and so both jars took up residence side by side in the family cupboard and a shaky truce was established. Time, maturity and apathy steadied the shaky truce, and now I’ll happily eat Vegemite with my Dad when I visit home, though I still buy Marmite for myself. Of course I’m still aware they taste different, but I don’t have a problem with a change once in a while. Reading the labels, both are meat free and suitable for vegetarians. Both boast an array of B vitamins (B1, B2, B3, B9), though Marmite ups the game and also has B12 and Iron in there. Both have a very low fat content, though Vegemite’s looks slightly lower. In the end, really, I think it just comes down to a matter of taste. But whichever you prefer, if you’re in the southern hemisphere and coming into summer like me, celebrate! 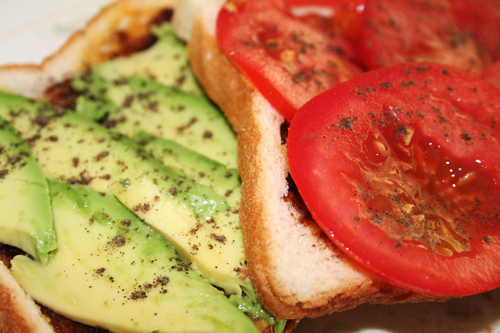 Eat your spread of choice with fresh tomato/avocado/whatever tastes great on toast. If you’re in the northern hemisphere you probably have no clue what I’m on about, and if you do you probably think I’m insane (I know it’s not a popular food choice outside of Australasia). But on the slight chance you’re on my wavelength , you can celebrate too! Marmite and Vegemite make a great stock substitute in gravies and stews, perfect for cold winter evenings.